XTC: SKYLARKING: 1986: 5 STARS OUT OF 5 STARS: Most consider Skylarking their most accomplished album. It is the one that introduced me to them. The making of the album was interesting- they brought in an American- musician-producer Todd Rundgren to do it and he and Andy Partridge reportedly got along like cats and dogs- but the result is fantastic. 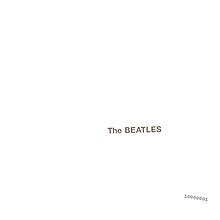 THE BEATLES: THE BEATLES: THE WHITE ALBUM: 1968; 5 STARS OUT OF 5 STARS: I listened to the re-mastered version of the original album as I took a car trip today. Sounds really great- and fresh. When Piggies was on and you heard the pig noises I was startled- for a half second I thought there was a pig in the car. THE BEATLES: THE EARLY BEATLES: STEREO AND MONO: 1965: 4 1/2 STARS OUT OF 5 STARS: I docked it 1/2 point- not on The Beatles but on Capital records and how they bastardized the albums released in the USA up until Sgt. Pepper. This was early material from the band that had been earlier released on Vee-Jay as Introducing The Beatles. Skylarking is my favorite XTC, and my second favourite is Apple Venus Volume 1 from 1999. Have you heard that one? Colin had kind of lost interest by then, but there’s some amazing Andy stuff. I haven’t heard that one– but plan on it. I’ve never liked much of his stuff from Nonsuch onward. I read recently that he basically stopped writing from that point, and they used outtakes from previous records as his contributions.